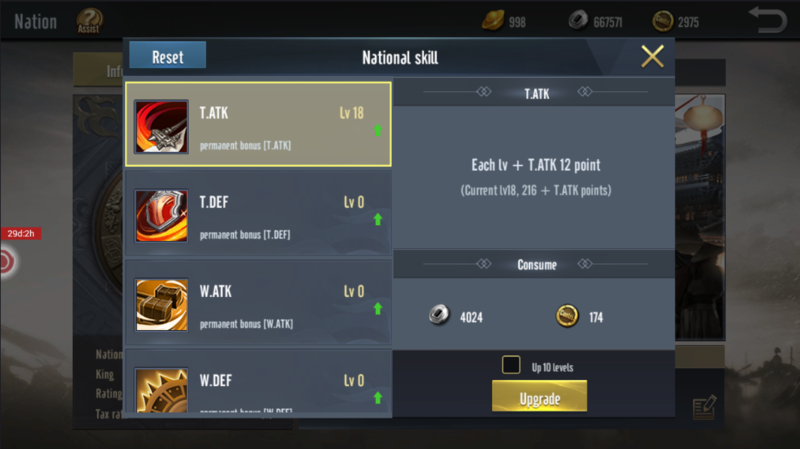 Upgrading the level will increase all the stats of general such as T.ATK, T.DEF, W.DEF, S.DEF, Force. 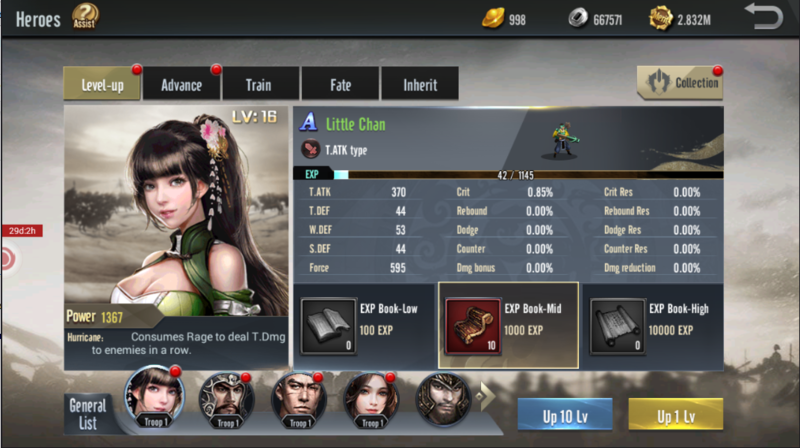 Dodge, counter, crit, dmg bonus, dmg reduction are heroes’ special attributes, max 70% (In battle, Dmg Bonus and Dmg Reduction limits of both sides are 70%). Hero’s quality is divided into: white, green, blue, yellow, red, purple, orange. Lords should use materials to enhance main attack dealers. When there are surplus material and general souls will be used to upgrade other generals. Lords reach level 50 to unlock “Train”. There are 4 types of training: Normal, Advanced, Platinum, Supreme. Normal training requires merit only while other types consume Gold. 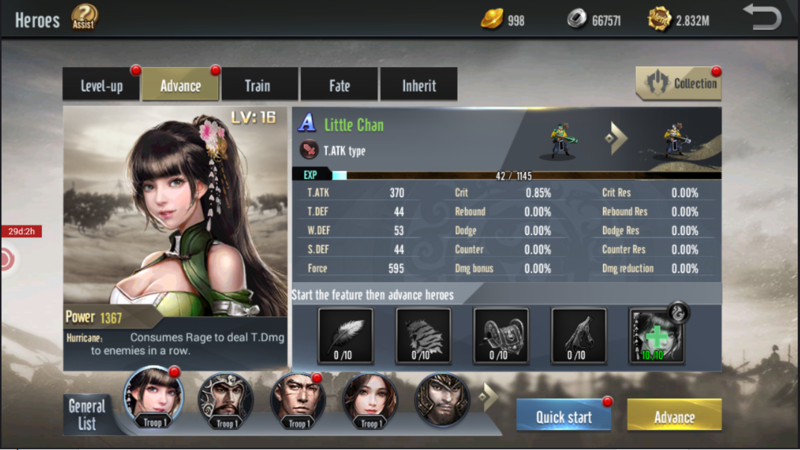 Level 65 unlocks “Fate”, Each hero has fates and use corresponding hero souls and jade to upgrade. 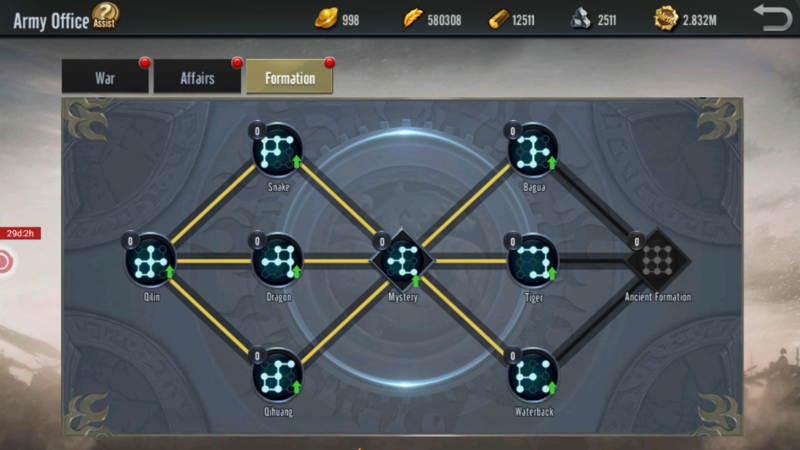 When upgrading fate, corresponding attributes will also increase, hero souls and jade needed increase as well. Fate level: White heroes: Level 1, Green: Level 2 - 4, Blue: Level 4 - 6, Yellow: Level 7 - 10, Red: 10 - 15, Purple: Level 16 - 38. 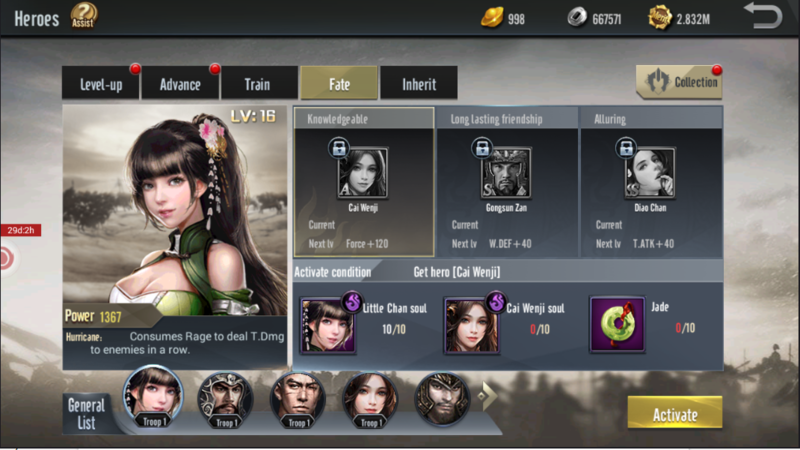 Fates above level 1 can be downgraded, returning 90% hero souls and jade. 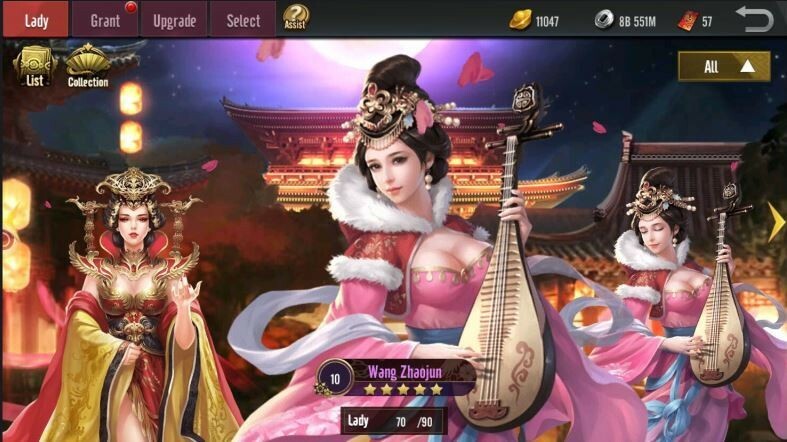 Lord should grant ladies to increase hero attributes based on quality and color. There are 6 types of camp: calvary, archer, infantry, support, strategist, support, weapon. 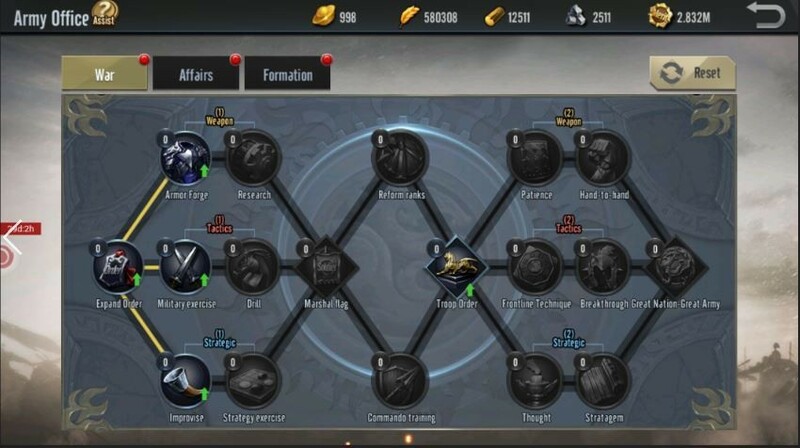 Each type of them will upgrade different stats for different types of generals. You will consume merits to increase the points in “War”. Each point will increase a single index. Depending on the team you play, you choose the indicator to upgrade. You can also reset the points to take back the merits and raise other points. 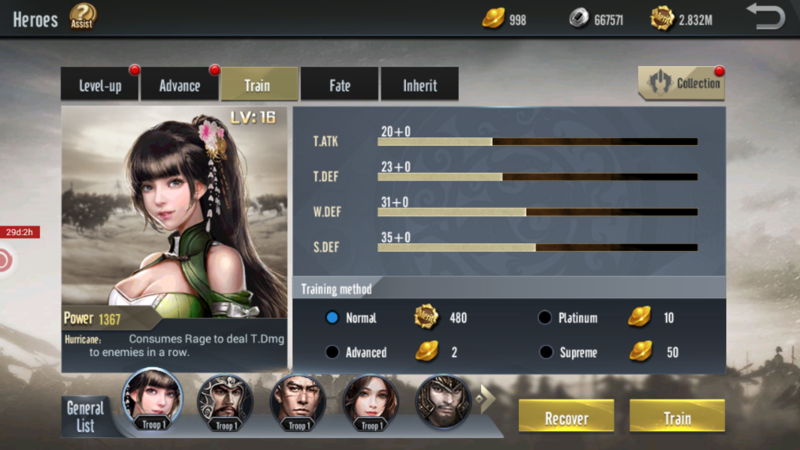 Among the points, there are “Reform ranks” and “Commando Training” that will increase your combat power by 7 times compared to others. Each battle will have different effects. 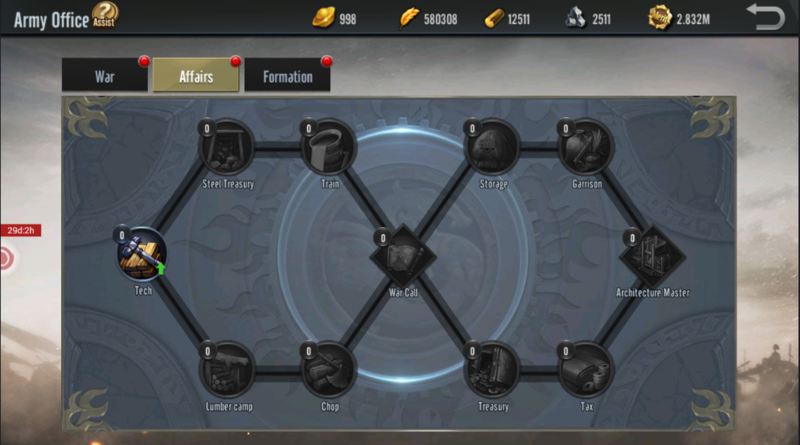 In “Affair”, the points can not be reset so you need to consider carefully before the upgrade. Especially in the “Architecture Master” will increase extremely battle force for your generals. National Skills will permanently increase your stats. Please select the necessary techniques to upgrade. You can reset the skill and the first reset is free.